Too Busy to Live? Try the Lip Stamp | Fashion. Style. Beauty. | Life is short. Live well. We’ve all had those moments where we’ve been rushing out the door and realize that we’ve forgotten our keys, our earrings, mascara or lipstick. We’ve got a fun little device for you if you’re looking to speed up that beauty routine: the Lip Stamp ($24.95). No, we’re not kidding. 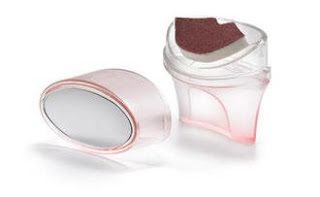 This ingenious invention comes with multiple lip-shaped pads to match your mouth or particular look. Just pluck off a pad (be sure to match the size of the stamp to your mouth shape and size), stick it on the pedestal, cover it in lipstick and press to your mouth like a stamp (we suggest rolling it from left to right to get full coverage.) Dab off any little excess and off you go! We used it on the way to an event the other day and we have to admit: it’s a neat little trick. We’re keeping ours saturated with our favorite lipstick and right next to our keys.